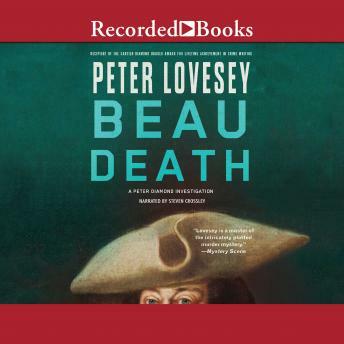 In the seventeenth installment in Peter Lovesey's timeless British detective series, Peter Diamond digs deep into Bath history to ferret out the secrets of one of its most famous (and scandalous) icons: Richard "Beau" Nash, who might have been the victim of a centuries-old murder. Bath, England: A wrecking crew is demolishing a row of townhouses in order to build a grocery store when they uncover a skeleton in one of the attics. The dead man is wearing authentic 1760s garb and on the floor next to it is a white tricorn hat-the ostentatious signature accessory of Beau Nash, one of Bath's most famous historical men-about-town, a fashion icon and incurable rake who, some say, ended up in a pauper's grave. Or did the Beau actually end up in a townhouse attic? The Beau Nash Society will be all in a tizzy when the truth is revealed to them. Chief Inspector Peter Diamond, who has been assigned to identify the remains, begins to fantasize about turning Nash scholarship on its ear. But one of his constables is stubbornly insisting the corpse can't be Nash's-the non-believer threatens to spoil Diamond's favorite theory, especially when he offers some pretty irrefutable evidence. Is Diamond on a historical goose chase? Should he actually be investigating a much more modern murder?